Countries around the world should prepare for an unprecedented rise in severe storms, droughts and heat waves, an international panel of climate scientists says in a new report. Global warming is leading to such severe storms, droughts and heat waves that countries should prepare for an unprecedented onslaught of deadly and costly weather disasters, an international panel of climate scientists says in a report issued March 28. The greatest danger from extreme weather is in highly populated, poor regions of the world, the report warns, but no corner of the globe — from Mumbai to Miami — is immune. The document by a Nobel Prize-winning panel of climate scientists forecasts stronger tropical cyclones and more frequent heat waves, deluges and droughts. The decision about whether or not to move is achingly difficult and I think it's one that the world community will have to face with increasing frequency in the future. In the past, the Intergovernmental Panel on Climate Change, founded in 1988 by the United Nations, has focused on the slow inexorable rise of temperatures and oceans as part of global warming. This report by the panel is the first to look at the less common but far more noticeable extreme weather changes, which recently have been costing on average about $80 billion a year in damage. "We mostly experience weather and climate through the extreme," said Stanford University climate scientist Chris Field, who is one of the report's top editors. "That's where we have the losses. That's where we have the insurance payments. That's where things have the potential to fall apart. "There is disaster risk almost everywhere." The scientists say that some places, particularly parts of Mumbai in India, could become uninhabitable from floods, storms and rising seas. In 2005, over 24 hours nearly 900 millimetres of rain fell on the city, killing more than 1,000 people and causing massive damage. Roughly 2.7 million people live in areas at risk of flooding. Other cities at lesser risk include Miami, Shanghai, Bangkok, China's Guangzhou, Vietnam's Ho Chi Minh City, Myanmar's Yangon (formerly known as Rangoon) and India's Kolkata (formerly known as Calcutta). The people of small island nations, such as the Maldives, may also need to abandon their homes because of rising seas and fierce storms. "The decision about whether or not to move is achingly difficult and I think it's one that the world community will have to face with increasing frequency in the future," Field said in a telephone news conference. This report -- the summary of which was issued in November -- is unique because it emphasizes managing risks and how taking precautions can work, Field said. In fact, the panel's report uses the word "risk" 4,387 times. Field pointed to storm-and-flood-prone Bangladesh, an impoverished country that has learned from its past disasters. In 1970, a Category 3 tropical cyclone named Bhola killed more than 300,000 people. In 2007, a stronger cyclone killed only 4,200 people. Despite the loss of life, the country is considered a success story because it was better prepared and invested in warning and disaster prevention, Field said. The study forecasts that some tropical cyclones — including some hurricanes in the United States — will be stronger because of global warming, but the number of storms should not increase and may drop slightly. 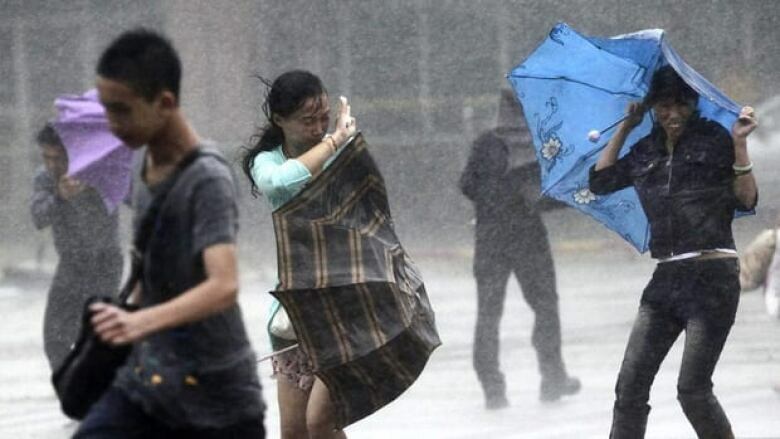 Some other specific changes in severe weather that the scientists said they had the most confidence in predicting include more heat waves and record hot temperatures worldwide, increased downpours in Alaska, Canada, northern and central Europe, East Africa and north Asia. IPCC chairman Rajendra Pachauri said that while all countries are getting hurt by increased climate extremes, the overwhelming majority of deaths are happening in poorer less developed places. That, combined with the fact that richer countries are generating more greenhouse gases from the burning of fossil fuels, makes the issue of weather extremes one of fairness. However, extremes aren't always deadly. Sometimes, they are just strange. Study co-author David Easterling of the National Climatic Data Center says this month's heat wave, while not deadly, fits the pattern of worsening extremes. The U.S. has set nearly 6,800 high temperature records in March. Last year, the United States set a record for billion-dollar weather disasters, though many were tornadoes, which can't be linked to global warming. "When you start putting all these events together, the insurance claims, it's just amazing," Easterling said. "It's pretty hard to deny the fact that there's got to be some climate signal." Northeastern University engineering and environment professor Auroop Ganguly, who didn't take part in writing the IPCC report, praised it and said the extreme weather it highlights "is one of the major and important types of what we would call 'global weirding.' " It's a phrase that some experts have been starting to use more to describe climate extremes.